Some people just don’t feel like facing another turkey for Thanksgiving. 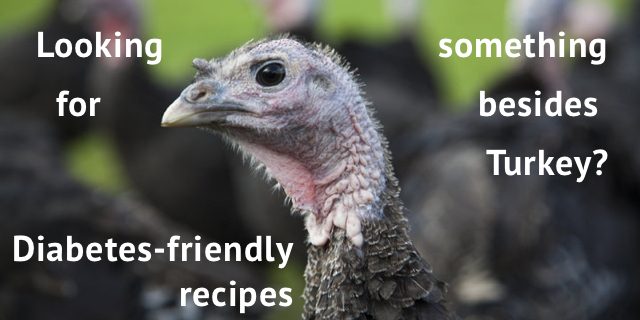 If you are one of them, and looking for diabetes-friendly recipes, I’m sharing a couple of recipes from Diabetic Living* that could a change of pace for this year’s feast. Preheat oven to 425 degrees. Line a large rimmed baking sheet with parchment paper. Combine mustard, garlic, lemon zest, lemon juice, rosemary, honey, salt and crushed red pepper in a small bowl. Combine panko, walnuts and oil in another small bowl. Place salmon on the prepared baking sheet. Spread the mustard mixture over the fish and sprinkle with the panko mixture, pressing to adhere. Lightly coat with cooking spray. Bake until the fish flakes easily with a fork, about 8 to 12 minutes, depending on thickness. Heat 1 teaspoon oil in a medium skillet over medium high heat. Add the steak and cook to desired doneness, 6 to 8 minutes per side for medium 145 degree Tent with foil and let stand for 10 minutes. Meanwhile grate 1 teaspoon zest and squeeze 1/4 cup juice from one of the oranges. Whisk the zest and juice, the remaining 2 teaspoon, oil vinegar, honey garlic, mustard paprika, rosemary and the remaining 1/4 teaspoon each salt and pepper in a small bowl. Peel the remaining 3 oranges and slice into rounds. Slice the steak thinly across the grain. Place arugula on a serving platter; top with the steak, the orange slices, onion, goat cheese or feta, and pecans. Drizzle with the vinaigrette. Enjoy! *These recipes come from Diabetic Living, Fall 2018 Volume 15, Number 4.